In 2004, our city leaders invested in a Toronto Indoor Pool Provision Strategy; the consultant’s final report offers 3 different options (scenarios); no indication on the city’s website which scenario was ultimately adopted. Also no indication whether the new Regent Park Aquatics Complex (or facilities planned for 2014 Pam Am Games) fit into this strategy (or is the strategy now “forgotten” ? )The city has been promising us a grand “Aquatics Complex” for several years; its original planned location was to be next to Lord Dufferin School. When the city used “world-class aquatic centre” in its Dec 2009 announcement, most of us assumed that the Regent Park pool would be “olympic” size, i.e. 50m pool. 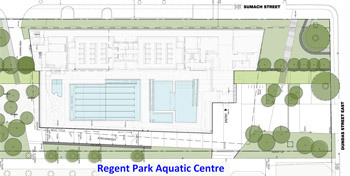 The latest plans for Regent Park show a well designed, half-sized pool – only 25m in length – for swim training/lessons, and other aquatics areas for recreation (eg. waterslide), all wheelchair accessible. But does this warrant a separate building? Elsewhere in the city, pools are efficiently and economically incorporated into a multi-purpose community / recreation centre, so preplexing why not in Regent Park? The latest plans say “expected construction start: summer 2010; expected opening: late 2011″. We sent this suggestion to the city recently; we’ll post their response as soon as it is received.